The workshop of the artist Rinat Sharafutdinov is located in the heart of the Magnitogorsk town. Within it is bright, quiet, and comfortable, with a pleasant smell of paint. There are books about his favorite artists on the shelves, and neatly stored canvases on the mezzanine. I hope that the readers of online journal “Russian Art & Paris” will be interested in getting acquainted with the works of an artist from Russia’s heartland. A new attitude, appropriate for our time, in which the territories of different cultures, civilizations, and religions are common to all of mankind, allows for the expansion of the horizons of art space. By enriching his own creative possibilities, any talented artist within this space can bring new life and contents, corresponding to his internal “I”, into old traditions. Rinat Sharafutdinov, with an inimitable individual style, is such an artist. Rinat Sharafutdinov is a colorful and extraordinary artist. Though he was educated in the monumental genre, he has fruitful work in the classical genres of landscape, portrait, and still life. Knowing well the “grammar” of his profession, he concentrates his creative research on the “architectonics” of painting. The rational, clearly thought out, scenic system of an artist is not just an “intellectual game.” It is a search for harmony, of both color and structure. In his compositions, everything is thought through: expressiveness of lines, forms, appropriateness of rhythmic repetitions, balance, organization of space through color, interaction of all the painting elements as a single and self- sufficient organism. On every specific canvas, the presence of a genuine poetic tone can be felt. Amidst this tone, the artist possesses a special natural feeling of decoration. • As one of the forms of understanding the surrounding world, the art of Rinat Sharafutdinov suggests not so much the reflection of visual interest, as the desire to escape from the everyday mundane standard to see color and shape as an absolute aesthetic category. • Landscape compositions with a clear decorative attitude are subject to a special logic of constructing space. Much attention is paid to the expressiveness of the silhouette, the interaction of color and shape, planarity, and volume. Textured and energized painting of the foreground is often balanced by the straight line of the horizon. An artist’s glance is capable of a complex panoramic vision. The small figures of people, at first glance, are of secondary importance, however their presence creates a “pastoral corner” of tranquility among the commotion of color, forming live moving simplified volumes. The chromaticity of the palette reaches the limit of sensation, turning into a celebration of red, blue, or green. When compositions are made with a single soloing color, painting begins to tangibly sound. The viewer’s imagination is activated, engaging in some magical supersensible reality where there is no concept of time. • In works on the eternal theme of the relationship between man and woman, color is brought to the highest level of richness and emotional tension. It becomes an open structural metaphor and carries with it an important burden: to symbolize passion, love. The form becomes a sign, and the space becomes even more conventional. • For an artist, it is characteristic to convey a variety of emotional states: from thoughtful and quiet sadness, to frank sensuality and expression. His works are attractive not only for the poetic insight into the essence of the visual world, but also for the painting technique, the complex structure of the paint layer, the variety of “precious” colors (silver, golden, bronze, etc. ), mystifyingly shimmering in color and light. In his search an artist does not limit himself to the reflections of the observed. He transforms natures forms, likening them to a symbol-sign, and connects components of the space into a single volume, reaching the utmost clarity in his compositional decisions. The artist’s main creative principle is treating the art form as an ever-changing reality. Pastel on paper. 65 x 50 cm. Rinat Sharafutdinov was born in the city of Magnitogorsk in 1959. During 1975-1979 he studied at the Art College in the city of Sverdlovsk. In 1987 he graduated from Moscow Art-Industrial College (the former Stroganoff College) where he studied at the department of monumental and decorative art in the studio of professor A.Orlovsky. Rinat was also a student of professor F.Voloshko and professor S.Godyna. 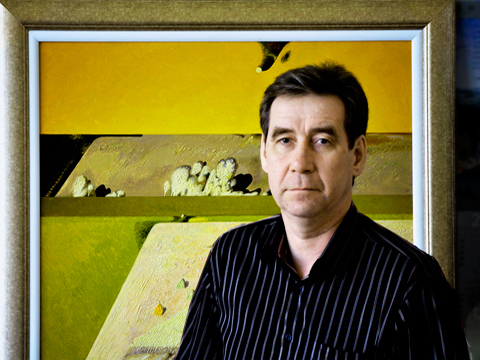 Rinat Sharafutdinov has been a member of the Union of Artists of the Russian Federation since 1993. As a digital image editor, I am most pleased to see the clarity, presentation, and presentation of the work presented at this gallery. So much of what is shown around the world is gray, banal, and un-appealing. Thank you for caring. An unstinting, especially eye-opening naturalism. The technique feels somewhere in between drawing and painting. Brilliant! Nice website you have here…thanks for sharing this information. may anyone get that type of information in such an ideal means of writing?